Toybank reaches out to kids at Tata Memorial Hospital! Toybank added more toys to the play centre at Tata Memorial Hospital, managed by V Care Foundation. Toybank has partnered with V Care Foundation to gift toys to their play centre once every three months. We carefully choose the toys to be sent to the children at the Tata Memorial Hospital. We gave many colorful musical toys and other new toys and recreational toys for the kids to play at the play centre. 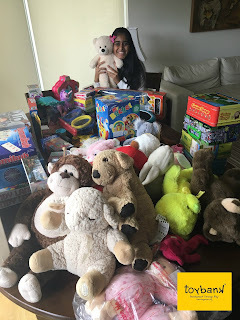 A BIG Thank You to our Toy Donor Ushasi Basu, for specifically donating new toys for the Hospital children. The kids at Tata Memorial will really love these toys, they get to play with these toys everyday! And volunteers from V care supervise these play sessions. 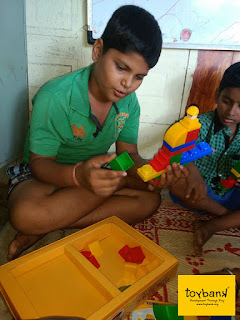 A volunteer at V Care says, “The toys make these children so happy that they forget whatever pain they are going through.” The children really become cheerful and become kids again by playing with these toys! A super duper hit game is ‘The Hungry Hippos’ which the children absolutely love playing. Vandanaji, the founder member of V Care Foundation told us that this game is so popular that children wait in a line to play this game! It is indeed a pleasure to see smiles on the faces of innocent children by a simple medium of a toy.